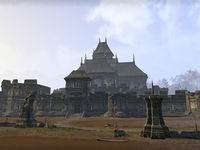 Fort Rayles is a keep in northwestern Cyrodiil, northwest of the Imperial City. It is initially controlled by the Daggerfall Covenant. It is connected via the Transitus Network to Fort Glademist and the Southern High Rock Gate, and only the Covenant can use these links. It is a base of operations for defense of the Scroll Temple of Alma Ruma. Controlling Rayles also gives control of Chorrol. Fort Rayles also appeared in Oblivion.